It’s fair to say that expectation can be a misleading accomplice. For months in the lead-up to the first Test of the 2015 Ashes, English pessimism accommodated Australian ebullience. The sense was strong from fans and pundits that Australia’s long lack of success in the United Kingdom was a particularly egregious accounting error that would soon be put to rights. It was easy to get swept away by rushing adrenaline. Mitchell Johnson would have his first crack at English batsmen since tearing through them like tissue paper 18 months ago. Mitchell Starc would have his first since the devastation he’d wrought in a triumphant World Cup. Josh Hazlewood had been the perfect back-up combination of threat and frugality, taking wickets of his own while giving no release. Nathan Lyon had passed Hugh Trumble as Australia’s most prolific off-spinner. They had knocked off 40 West Indies wickets in no time, and the expectation was for more of the same. For the first hour in Cardiff it looked like expectation would make itself manifest. Hazlewood produced a classic early slips dismissal to send back Adam Lyth. Lyon came on early to defeat Alastair Cook with extra bounce and a nicked cut. Starc produced fast full swing to pin Ian Bell, then nearly had Joe Root leg before, then had him dropped. A matter of time until the job was done. At which point began a lesson in patience that extended over that whole first innings. Root and Gary Ballance gave half chances aplenty but never fully extended one. They stayed around, and the changing game cohered around them. Even for those of us who watch or play an inordinate amount of Test cricket, it’s still easy to lose its rhythm. Accustomed to thinking in highlight reels, we can view the slow build with frustration or a lack of clarity. We jump to absurd conclusions. When Root and Ballance were new to the crease, they were doomed to be part of a lightning collapse. After half an hour, they were destined to bat forever. Australia’s bowlers would destroy them. Australia’s bowlers were overrated. Unstoppable. Toothless. Ballance and Root wouldn’t last five minutes. They would bat the full five days. By the time Ballance was dismissed he’d made 61. They’d put on 153. VVS Laxman and Rahul Dravid it was not. But the full gamut of emotion around it had been run. The real point was that the pitch was not deadly and the partnership was resilient. In these conditions bowling sides have to call on patience. The good ones settle into a calm and considered approach, tying down the scoring while trying to produce deliveries with enough nagging threat to eventually be realised. They had better learn how. The wicket in Cardiff was not, contrary to many reports, inordinately slow. It was good enough to produce 22 wickets and 750 runs by early on day three. But there are unlikely to be any pitches this summer that offer the kind of speed and bounce that would suit Australian bowlers. In Cardiff, the attack kept dragging short on a surface doing nothing to support it. The bowlers were frustrated, boundary balls were given away. It was partly England’s aggressive approach, but partly the effect that had on the bowling side. 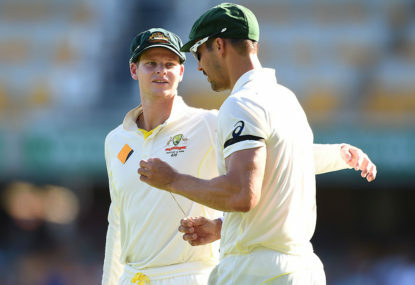 Even Hazlewood went at three and a half runs an over in the match, Johnson and Starc at four and a half. In the first innings, only after Hazlewood underlined his importance by removing Ballance was a breach created. From there, the value of persistence showed itself. Wickets gradually came, seven by the end of the day, the rest the next morning. It was frustrating, no doubt: a morning when Moeen Ali and England’s bowlers added 87 in 14 overs. But sometimes all a bowling side can do is keep dishing up the ball and wait the innings out. Patience remains more important on this tour than dynamism and aggression and any comments about ‘brands’. Even on slow tracks, the side with the better pace attack should win. They’ll just win more slowly. But where they lose patience, that advantage will vanish. Aggression is the jelly in the trifle – delicious and moreish, but it can’t exist without the surrounding architecture of sponge to contain and support it. All things must be housed in context. Not everything can happen instantly for Australia this series, a lesson both for the team and those who follow them. For the former, a successful comeback from 1-0 down will depend whether they can heed it. This was first published on Wisden India.